Katie Cole’s New Album: "Lay It All Down"
Katie Cole has done wonders putting together her new album Lay It All Down, and I believe I owe it to her to write this out. Much of the newer music is actually very captivating as in it’s something I can relate to personally, but I think she makes it very clear about how we all go through the grinds of life, both the positives and the negatives. I would say overall, if there could be any additions, it would be a message to everyone that always keep one’s eyes open (essentially using the old Russian proverb of trust, but verify). Yeah, it’s a good laugh in the sense that +The Tea Party has no intellectual means of expressing their rage with +Barack Obama. However, one should not make the mistake that there’s a second message, one where we need to punish Russia militarily for mocking us. I’ve heard of wars starting over circumstances even goofier than this, but this is no laughing matter. Here’s the story from Addicting Info. A war with Russia, would cause more problems than anyone should care to think about. I mean, we’re talking the world’s largest stockpile of Nuclear Weapons. Anyway, I find it infuriating listening to politicians such as +Lindsey Graham and +John McCain, talking eagerly about getting into another war, as if they simply want a first resort military option. That’s not an effective foreign policy. Next of all, what is the point in going after Russia militarily? What do they have that we want? Oil? Natural Gas? News Flash: we have more natural gas than they do, and as for oil, there’s a boom in North Dakota. Translation: We don’t need it. Outside of their space program, and maybe new trade partnerships, there’s nothing to gain from going after the Russians in a military sense. Watching the events unfold in the ongoing war of words between Russia and Ukraine, I find it reletively unsurprising that +Vladimir Putin would attempt something so bold. He’s causing mischief abroad to soak up support at home as a means of distracting the Russians from a practically free-falling economy. As a good means of keeping public support up at home meant attacking another sovereign nation within the “Near Abroad.” By doing this, Putin’s showed a complete disregard for any agreements that Russia’s signed in helping to shape international law. In addition, it shows a complete disregard for any international law and national sovereignty of Russia’s neighbors, this time being Ukraine. However, I will say this about Russians as a people: most are not like the current leadership in Moscow. As a people, they’re largely docile and peaceful, and some of the most pleasant to be around. Another thing to bear in mind about Russian culture is that the people place a lot more emphasis on intellectuallism and pragmatism, rather than fierce ideology and violence. All this mischief making was bound to get Putin in trouble sooner or later, and I think now it’s pretty much gotten him in a deep hole. There’s no denying it; even as events unfold in his favor, Putin’s largely alienated any good will from national leaders (such as +Barack Obama and +Angela Merkel) that he needs to keep Russia afloat. Just as much as the West cannot get anywhere in solving problems without Russia, as history has proven time and again, the inverse is also true, as Russia cannot get anywhere solving problems at least current ones without the West. Both Obama and Merkel have noted a recent, yet disturbing, trend with Putin as of late, it’s as if he’s losing all connection to reality. If anything, an aggressive foreign policy and a leader whose spoken lines are badly slurred, it signals only one thing, a leader corrupted by vast power and money. Yet at the same time, Putin’s also been saying several factors have to be strung together to get Russia’s recognition of Ukraine’s new governing administration, some of which do not coincide with each other. That’s a sign also that someone’s on the verge of a complete breakdown. Turning to Ukraine, the deposed president of that nation, +Viktor Yanukovych, was an acolyte of Putin’s, who only won the presidency in 2010 due to Putin’s help. If anything, that’s a classic case of Russia meddling in the affairs of its neighbors. Now that Yanukovych has lost power by fleeing to Moscow, he now has nothing to return to. The party that backed him, the Party of Regions, has said quite flatly they will not give him an ounce of support. It’s apparent now that any return by Yanukovych to Ukraine would certainly see his arrest for his handling of the protests to start opening up the political rings to help solve problems, and his orders to violently suppress the protests in complete disregard of his citizen’s lives. However, by fleeing to Russia, Yanukovych now has no connection to Ukraine at all, and now cannot credibly say anything on the people’s behalf. See the thing is that you can’t grow an economy when you’ve got wages as low as hell. You want us to by more to keep the machine going? 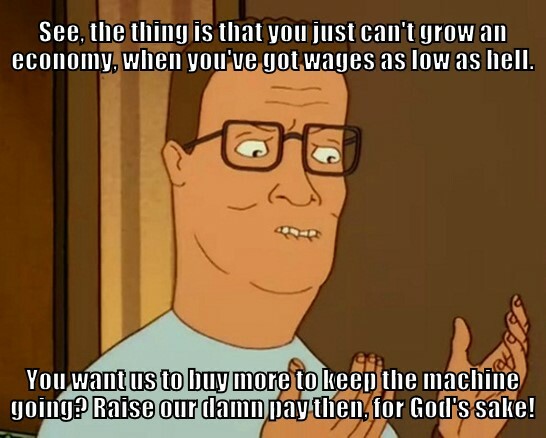 Raise our damn pay then, for God’s sake!